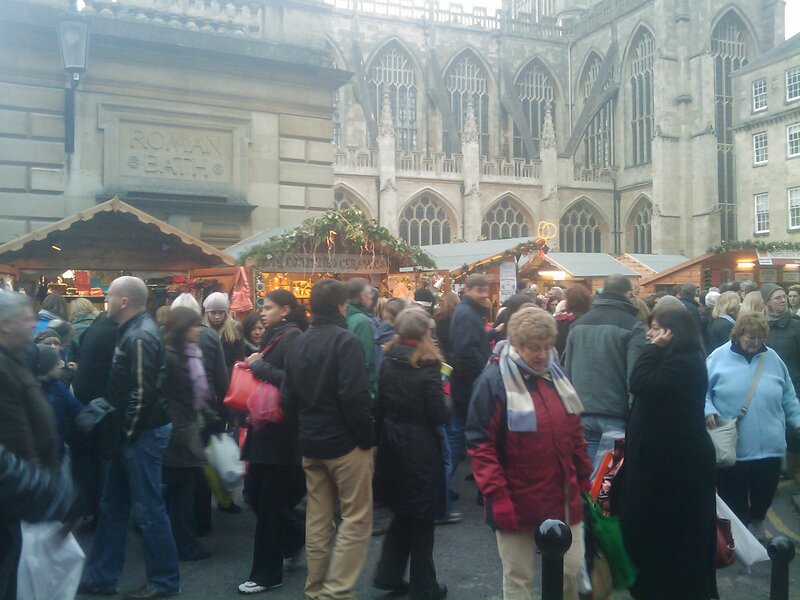 This weekend Sam and I were down in Bath for the Christmas Market. The market is huge – some 100+ stalls around the centre of the city. I think we managed to see just about all of them! The number of people there is simply staggering. Every square inch of the city seems to be filled with people meandering from stall to stall. Thankfully though, there are plenty of stalls selling mulled wine to keep the crowds buzzing along happily! We managed to pick up a few bits and pieces: some awesome cheese, some amazing spice mixes and some sloe gin liqueur. We also managed to pick up the last few of our Christmas presents. Just two more to order off the intarwebs now and we’re done. This must be some kind of record for us: Christmas shopping done and its not even December yet! Unfortunately we left it a bit late to book anywhere in Bath itself, so we found ourselves staying in Keynsham. The hotel Sam found – the Old Manor House in Keynsham – turned out to be an amazing find. Although a way out of Bath, it’s only 5 miles from Newbridge park & ride, which gets you into Bath for £2.50 return. The hotel itself is a wonderful, old building – although the room we stayed in hadn’t been updated in a while, everything was functional and in good order and they have apparently renovated some of their rooms. However for £89 for a double room for the night they’re a fraction of the price of rooms in Bath, particularly at this time of year – making this a really good way to visit Bath. My only gripe would be the price of food in the hotel. We ate in the hotel on the first night – so naturally since neither of us were driving consumed our fair share of wine (and probably somebody else’s fair share). The food itself was very good – but at over £30 a head for three courses, plus drinks it seems a bit overpriced. But this was a minor gripe – otherwise the hotel was excellent. On Saturday we went back to a pub we discovered last time we were visiting Bath. The Kings Arms in Monkton Farleigh is an incredible country pub. A roaring fire and plenty of good ales on tap – just what you need at the end of a long drive down treacherous country roads! Thankfully the food was every bit as good as I remember it being from last time. I had chicken liver parfait followed by venison steaks. Delicious. I’m not normally one for going back to the same place twice, but in the case of the Kings Arms I’ll make an exception!